When Hollywood Pies first started “delivering” pizzas from a parking lot near Robertson and Pico 2 years ago I was intrigued. How could I not be? All the heavy deliciousness of a Chicago style deep dish, combined with the heavy thrill of a nighttime drug deal.What could be bad about that? I’ll tell you what. Like any good pusher, they only sold pizzas at night! So I waited. And waited, hoping that one day I’d be able to satisfy my daytime fix with a Noon order of one of their much praised pies. Well, that day has finally come. 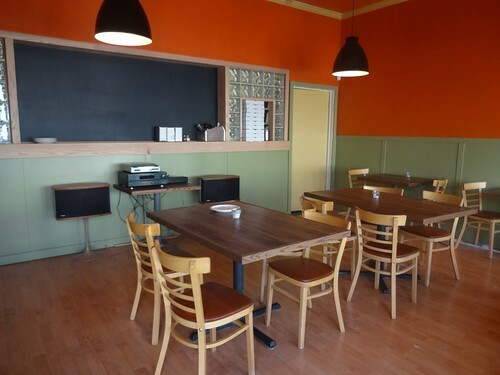 They finally opened a sit down, brick and mortar location (a pizza dispensary, if you will) and they’re open for lunch on Fridays and Saturdays from Noon to 3pm. There’s talk of them expanding the menu to include salads and specials, but right now it’s just Chicago style deep dish pizza topped with some combination of sauce, cheeses, meats and veggies. A small pizza goes for $13-16 but easily feeds two, making it a bonafide Midtown Lunch. Order at the counter, and then wait the 30 minutes for them to make your pie. You read that right… this is not fast food. Need to get back to work within the hour? You might want to order this one for pick up. We went with the classic chicago, which meant fresh mozzarella, Italian sausage, and fresh house-made ricotta topped with their chunky tomato sauce. 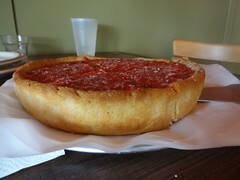 I’m no Chicago deep dish expert, but apparently it’s more Gino’s East than Lou Malnatti’s, if such things interest you. 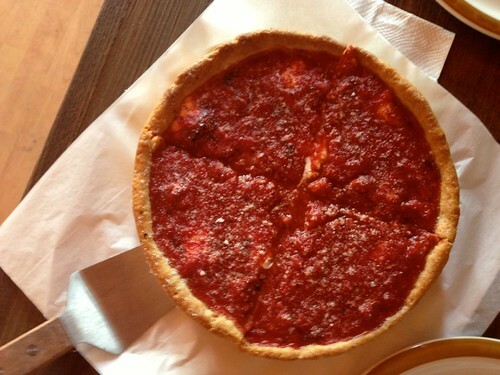 For me, it was just a damn good deep dish pizza made by a dude who is super passionate about making pizza. The sauce was tangy and flavorful, and the crust teetered that perfect line between pizza dough and buttermilk biscuit. And even though the small has the diameter of a pie that I could normally finish on my own, the girth more than makes that impossible so be sure to bring a friend. Want to order a large? Bring 3. Posted by Zach Brooks at 9:57 am, April 11th, 2013 under Hollywood Pies, Mid-City/Miracle Mile, Pizza. And yes–definitely more Gino’s East than Lou Malnatti’s, because Gino’s East is fantastic and Lou Malnatti’s is blech. Checked out the sit-down location the other day. Very chill. 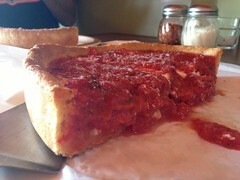 Deep dish was as good as ever. Can’t wait to go back to try the thin crust they’re now serving as well.